Lloyd Griffith, Comedian: Famous Last Words. The stand-up in conversation. Expect jokes, dubious impressions, jokes, a bit of choral singing, jokes, maybe a fact about a Cathedral, jokes and probably the story about that time he had a toilet incident on the A46. 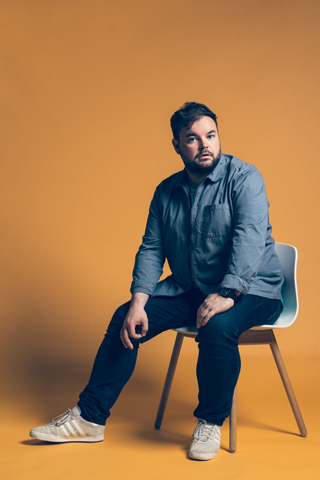 All Rounder promises to be a rip-roaring, hilarious show from Lloyd Griffith ,one of the UK’s fastest rising stand-up talents, as at ease discussing the trials and tribulations of his chequered love life as he is at listing his favourite English Cathedrals. Someone got on the wrong train the other day. He was a tourist and I spent about 10 minutes trying to explain where he should go and when the return train would be. Anyway, I missed my stop, so I was actually fuming with him in the end. As in alcoholic drink? I’d probably say a gluten free lager. Hear me out. I never drink that normally, however when you drink lager you get quite gassy, where gluten free beer is not as gassy. If it was my last night on earth and I died the next day I would essentially be a gassy bomb, so if anything I’m being quite thoughtful to the undertakers who are looking after me. Unless it’s the end of the Earth for everyone, then I’d probably say a Blue WKD. Pizza Hut all you can eat buffet – think about it – it never ends as I’ll just keep going for years and years and years. I’ve thought about this before lads. A Lincoln City fan after a Grimsby v Lincoln game and it doesn’t go our way. Exeter Cathedral. I’m obsessed with Cathedrals and Exeter is my favourite, so I’d probably just knock about in there. I have literally no idea what you mean by loot. Love – I’d say don’t ever try and force love on anyone or be forced it on you, it should always be organic. If it ain’t working, move on. Life – ‘always be happy’. Whatever you’re doing always make sure that you’re happy doing it. If you’re not, why are you doing it? I love Fire Engines so much and as a result I have collected loads of fire engine memorabilia over the years. I have numerous helmets, wallets and bags made out of recycled fire hose, candle stick holders made out of fire hydrants, a few jackets…. honestly, it’s weird. Watch me light this fart.